This has been one of my favorite recent series. 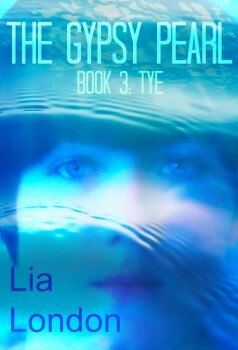 And it just so happens to be written by a friend of mine, Lia London. (But she became a friend after I’d been introduced to her fabulous writing.) Today, I’m featuring the newly released third and final book in her Gypsy Pearl series, which I had the pleasure of beta reading. Caz has been given three gifts. She’s been named the Gypsy queen. Now she’s arrived on the last planet in the Granbo System. But as she makes her way to the rendezvous point where she will complete the cycling of the pearl and take up her mantle, she wonders why the third gift has given her no special powers like the first two did. And as she is exposed to the variety of cultures on Tye, she begins to have doubts. How can she unite so many different governments and people groups? Good questions. And we see Caz struggling here in this book more than in any other. This story resonates with gentle nudges of wisdom that are well balanced by Caz’s quick wit. Chose to be happy. Decide to survive. And it changes Caz. At one point her boyfriend Alf observes, “You are not a wave watcher, Caz. You are the wave.” It is Caz who drives this series. It is her growth that is so admirable and fun to watch. And it is so satisfying to see her journey reach its conclusion. Loved this series! Grab a copy. They’re often .99 and never more than 2.99. It just so happens that while I was beta reading the last Gypsy book, Lia was beta reading my newbie, Ella Wood. Very blessed to give and take with someone of Lia’s calibre. She recently posted her response to Ella Wood as well as a short 4-question interview. Catch them on her website! Still with me? Good! Because another of my beta readers, Patricia Tilton, featured Ella Wood on her blog today. Head over to Children’s Books Heal! This book resonates with me. I love the lines of wisdom you shared — things I think about all the time in relationship to our world. My favorite kind of book–gives us something to chew on with our entertainment. Great quote – it certainly had me wanting to read more about the inner thoughts of the protagonist! Great protagonist–quirky and funny yet conflicted. Cool. It sounds like a great book. Oh, you’d love this series, Erik. Adventure, positive messages, and a really funny protagonist!